PROTESTERS claim developers and the council have gone back on promises to protect a park from construction traffic. 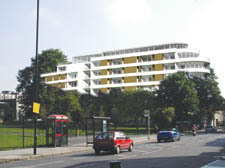 Talacre Gardens, Kentish Town, remain threatened by an agreement by the council to allow builders’ lorries and emergency vehicles to use a park footpath as “temporary access” during the construction of a seven-storey block of flats in nearby Dalby Street, according to protesters. They have acq­uired documents in advance of a public in­quiry this month into road changes required for the project. The “temporary access” plans are buried in a section 106 agreement reached between the Town Hall and developers TRAC Properties, lodged at the Land Registry and disclosed earlier this year by the New Journal. In the face of campaigning, TRAC agreed in February to shelve the plan for access to Talacre Sports Centre and the construction site, on which it plans 51 apartments and a medical centre. But the old “temporary access” plan, referring to the cross-park route, resurfaced in documents prepared in September for the inquiry into the “stopping up” of Dalby Street – closing the existing road and opening a New Dalby Street a few yards away, vital for TRAC’s plans.